I have so many cooking magazine subscriptions that I often get behind on reading them. Sometimes I think I do it on purpose, because there is something particularly satisfying about having a nice little pile to go through, rather than reading them one by one as they trickle into my mailbox. The only down side is that I'm often behind the season. I get great Thanksgiving and Christmas ideas in February. I find all kinds of wonderful things I can do with corn, tomatoes, and zucchini just as Halloween is coming around. And I rarely can remember from which issue I got any recipe (which is why I make sure to note it on any recipes or articles I tear out for future use). You get the idea. 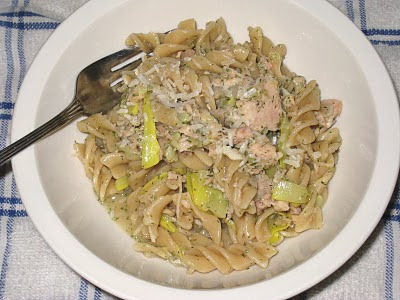 So I'm not sure in which issue of Bon Appetit Ithe BA Foodist shared a recipe from Chris Cosentino for pasta with tuna, but the idea of using the oil from the tuna for the sauce was ingenious to me. I had recently switched to oil-packed tuna because the tuna that comes packed in spring water has become inedibly mushy to me over the years. I don't use tuna often, so when I do use it I want it to be the best. But I hate pouring all of that oil down the drain, so I was thrilled to discover a use for it. Cosentino's method calls for traditionally cooked pasta, but I started thinking that using the oil from the tuna would work quite well for the absorption method. I had a beautiful summer squash in the refrigerator that I thought would round out the dish beautifully. The joy of absorption pasta is that it doesn't take too much thought, and the possibilities are endless. This makes an especially lovely summer lunch. If I'd had any tomatoes around, I would have added them when I added the tuna. They would have brightened up the dish visually and would have tasted good, too. Drain oil from tuna into 10-inch skillet over medium-high heat. Add onions and garlic and cook for a minute or two, until the onion just starts to turn translucent. Add pasta and continue to cook for another two minutes. Add water to just cover the pasta. Season with salt and pepper and stir once. Cover the pan and lower the heat. Cook for 10 minutes, then check the liquid level and add more if necessary. (Be careful not to add too much.) Cook until the pasta is about 2 minutes from being done, when it is still a little crunchy. Add the summer squash, cover the pan again, and cook for another 2 minutes, until the pasta is al dente. Remove the lid and turn the heat up to high just long enough to cook out any excess liquid. Add the tuna and cook until just heated through. Remove from the heat, add the dill and the cheese, and stir gently. Taste for seasonings and adjust as necessary.